The Twin Cities gets its nickname from the cities Minneapolis and St. Paul. 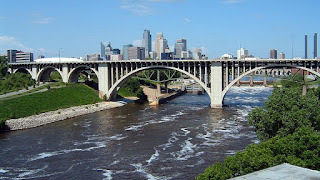 They're divided by the Mississippi River, with Minneapolis on the west bank and St. Paul on the east. After moving here, I discovered that residents often sort themselves based on which side of the river they live on. I remember telling a coworker about an interesting place I'd visited over the weekend. He sniffed disdainfully and said, "oh, that's on the east side. I never cross the river." It was a common refrain. I attended a local gaming event last week and I counted three groups running ancient to medieval miniatures. We had 9 people playing Field of Glory (FoG) in 15mm. A second club had 9 people playing FoG-Renaissance in 10mm. A third group was playing Impetus in 28mm over two tables. There isn't a lot of crossover between our groups even though we all share a passion for history and miniature gaming. People seem to sort themselves based on ruleset, scale and club. Since I play one set of rule (FoG) in one scale (15mm) with one club on one side of the river (east), I'm guilty of it as well. I've been thinking about crossing the river, so to speak. I've thought about gaming with the club that does Renaissance in 10mm. Since 10mm is outside the scale that I'm painting and playing, I hesitate to give this a go. Lately I've been eyeing the Impetus rules. The way they use fewer figures per base and make each base a diorama is very appealing to me. I asked one of the Impetus guys if he'd host a demo game over the holidays so I can see what these rules are like. He told me the Impetus group fields 28mm exclusively and at this, I hesitated again. I have 5 ancient and medieval armies in 15mm. 28mm is more expensive than 15mm and much more time-consuming to paint. After rules, scale is another river that divides us. 6mm, 10mm, 15mm, 28mm, fantasy, historical, science fiction, Hail Caesar, Impetus, FoG and DBM...it's frankly amazing we can get two or more people to agree to game anything! I decided to go ahead and get a game of Impetus in. At a minimum, I get to see a new set of rules in action and I might have the opportunity to mix it up with the Impetus guys from time to time. Its also possible that I might like the rules enough to cross over to 28mm for a change of pace. So many rivers to cross, so little time. See you on the bridge! Artar, one day after my kids go away to college, I must visit Turkey and Istanbul in particular. And I want to visit both sides! You must do it. Come and see..